Honey Roast Root Veg Soup a warming Superfood Soup perfect for cold winter days when you need comfort food but still want to be good ! A slightly sweet, earthy soup full of root veg goodness. It’s also very, very healthy! Sometimes, I have a foodie idea that starts off (in my head at least) incredible, but by the time I come to serve it up, I’m fretting that it’ll taste horrendous. Jonny is very sweet in my epic moments of kitchen failure but equally, he’s very honest. Which is a good thing, right? So as I was ladling this very pretty coloured root veg soup into the bowls, I was wincing inside, wondering how bad it was going to be. I mean, parsnips are sweet and sweet potatoes are obviously sweet, and here I was adding honey to them. Thankfully, and somewhat surprisingly, it tasted good. Actually, it tasted really good. There was a hint of sweetness, but it wasn’t overwhelming, rather it enhanced the natural flavour of the root veg. I think the dash of chilli helped too. It wasn’t enough to blow your brains out by any means, but without it I wonder of the soup would have tasted a little too much like, pudding. May I recommend you bookmark or pin this recipe for when you have a fridge full of veggies that are about to commit suicide. Soups are so forgiving when it come to wrinkly turnips and wobbly carrots, and once you’ve turned them into this glorious bowl of goodness, it’ll freeze well until another day. Peel and chop all the root veg into inch cubes. Toss in a baking tray with the oil and roast for 15 minutes. Place a mug into a jug of freshly boiled water to allow the dressing ingredients to warm through. Into the mug, mix the honey, balsamic vinegar, chilli and garlic. Add in the chopped onions and mix the now warm and runny dressing over all the veg, mixing well. Pop back in the oven for 20-30 minutes, or until all the veggies are soft but before they pick up much colour. Tip all the veg into a large pan, pour in the stock or water and blitz with a stick blender until beautifully smooth. Season with pepper and taste before adding any salt. We love roast veggies and make loads of soup not only winter but all year – real fans! I totally agree about the chilli. I often add it to root soups as it gives a lovely backnote of heat without overpowering the dish – that is if you don’t add too much of course.Otherwise everyone starts to sweat at the table, at least in my household. Your soup sounds really lovely, I love the use of honey in it too. Ohh J, need some good soup recipes for when I get back to my home which I am missing a bit. This looks good. Perfect for this kind of weather. I have lots of veggies to use up and some new smoked chilli honey so you’ve given me an idea for a new use for that. Oooh yum. That’ll be a great mix Ren! I’m laughing at the suicidal veg! I’m ashamed to say I still have sprouts lurking in there from Christmas – they actually look almost edible. Your soup looks fab – I will try roasting some of my root veg next time as I would imagine it adds depth of flavour? 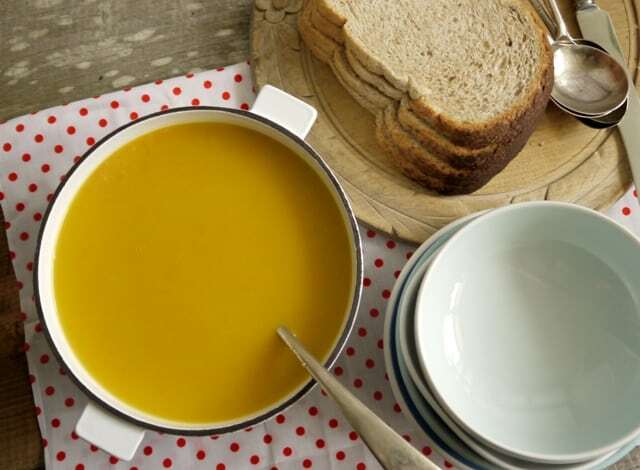 Pudding soup, what a fab idea ;-) Love soup, as you say, it’s forgiving and we eat a lot of it. I have never yet added honey though, so that’s given me something to think about. Looks great, love roasted vegetables, the honey will add a lovely extra touch of sweetness. I regularly make a roasted root soup, usually when I’m choca full of veggies that are past their best too!. Loving the idea of adding a little honey, balsamic and chilli to the roasting too. Yuuum. It sure makes for a tasty bowl of goodness! Just the name of this is enough to tempt me! Looks wonderful and perfect for winter. It sounds excellent and looks lush! Quick add it to this month’s No Croutons Required. Delicious sounding soup Janie , perfect for a winter afternoon or night ummm! It sure would be perfect today Manjiri, it is blowing a hoolie down here! This sounds lovely and warming. I love the balsamic vinegar in it too. That’s a delicious looking bowl of soup. Loving all the additional ingredients to enhance the flavour of the root vegetables. Aw, thanks Vanesther, I hope you enjoy it as much as we did! Sounds fabulous! And the soup turned out such a pretty color. I like the addition of a little spice to kick the soup up a notch! Ahh lovely. I adore roasted root veg. I have some luchito smoked chilli honey that I think would work well with this soup so am bookmarking this recipe for next week. I often make roast veggie soup, but honey roasted is anew one. Will have to try. What a gorgeous colour! I love the sound and look of this soup and think roasting the veg beforehand really makes a difference. I always have wrinkly roots lurking at the bottom of the veg drawer and this would be the ideal remedy!